In study after study, we see that the top features consumers look for in their next device are extended battery life and faster charging. Qualcomm Technologies is dedicated to meeting both these needs with our Qualcomm Snapdragon Mobile Platforms and Qualcomm Quick Charge fast charging technology. Snapdragon mobile platforms are designed with power efficiency to get you through the day on a single charge. With each generation, Snapdragon mobile platforms get better at meeting the demands of the power user. Take the Snapdragon 835. Compared to its predecessor, the Snapdragon 821, the Snapdragon 835 boasts a greater-than 25 percent power reduction. This allows you to do more power intensive activities on a single charge, such as VR gaming and 4K video streaming. While the goal is to get you through a day, or more, without the need to recharge, there will undoubtedly be the occasional need to reach for the power cord. That’s when Quick Charge can save the day. When Quick Charge 4 was announced, it promised to bring even faster charging than its predecessor, allowing a device to go from empty to 50 percent in just 15 minutes. We added new technologies designed to further extend battery cycle life, enhance safety, and expand charging intelligence. These features come standard with a device that includes Quick Charge 4. But we haven’t been resting on our accomplishments since then. In fact, since that time we developed new enhancements and created a special program for those device and accessory manufacturers who design their products with these new features included. 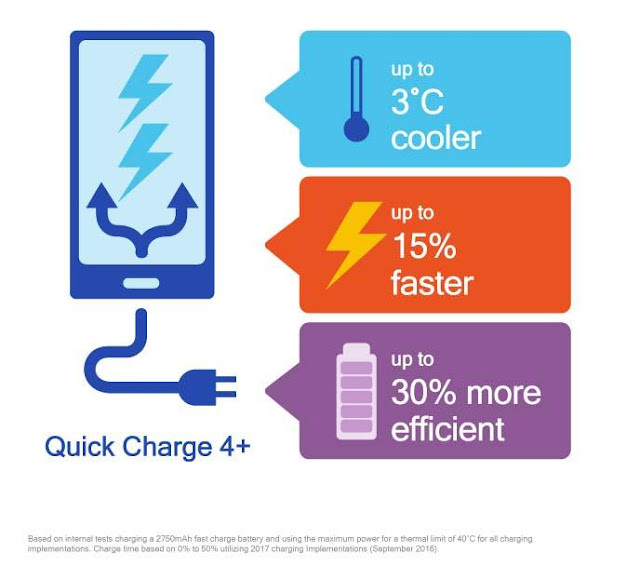 We call this the “plus” program, as in Quick Charge 4+.